The Smartphone: Is It Smart Enough? Can’t remember your mother-in-law’s birthday? Lost in a new city? Struggling with Spanish? Your toddler won’t stop crying? Don’t panic. Smartphone to the rescue! The smartphone has taken over the world, and the medical industry as well. With the integration of mobile technology into health care over the past decade, the medical field has witnessed revolutionary changes in practice patterns and educational methods. Approximately 80% of physicians use digital applications on a mobile device in their day-to-day clinical practice, with the trend being higher in younger health-care providers. The Apple App Store claimed to have approximately 800 applications (“apps”) at its launch in 2008, which has now exploded to more than 775,000! The medical app market is reported to be one of the fastest growing markets among the various app categories. The Apple App Store introduced a section dedicated to healthcare professionals in September 2011 with a humble collection of 50 apps. Today, a search in the App Store with the terms “medical,” “health,” or “healthcare” populates more than 4,700, 8,000, and 900 apps, respectively. But are these available medical applications “smart” enough to intrigue nephrologists? 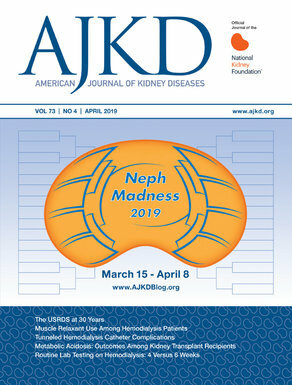 Apparently not, according to a survey we conducted among the Division of Nephrology at the University of Pittsburgh (see related eAJKD post). The survey, designed to identify smartphone usage trends among nephrologists and their perceived needs for novel mobile applications, revealed that about 55% of providers used digital mobile applications on their portable electronic devices for clinical decision-making frequently. The most popular applications were medical calculators (62.9%) and reference databases like Medscape and Epocrates (57.1%). The respondents were asked “If you had an application on your mobile device that could walk you through the approach to a clinical problem, what would that be?” The most requested topic was “Disorders of sodium and water metabolism” (58.1%), followed by “Disorders of calcium, phosphate & magnesium metabolism” (54.8%), “Secondary hypertension” (41.9%), and “Acid-base disorders” (41.9%). These data reflect that despite the myriad of medical applications available for the smartphone, there is a perceived lack of clinically useful apps in the field of nephrology. The Apple App Store pulled up meager 41 and 125 apps with searches for apps using terms “nephrology” or “kidney,” respectively. However, it is challenging for smartphone-savvy physicians to find useful medical apps since they are currently unregulated. From a current fellow’s perspective, listed below are ten must-have apps for a nephrology provider. It is important for future app developers to note the Food and Drug Administration issued draft guidance on the regulatory policy of certain categories of mobile medical apps in July 2011, and the final report on the regulatory framework is expected by the end of 2013. This information can guide future researchers in developing clinically relevant and innovative educational nephrology apps. With the rapid evolution of wireless medicine, the use of mobile health information by medical providers is only expected to rise. Whether adoption of these novel practices translates into enhanced clinical knowledge and skills is yet to be determined. The smartphone has successfully brought medicine literally to our fingertips. Do we need more? Probably. Please share what apps you are using! 2 Comments on The Smartphone: Is It Smart Enough? Or maybe you were just shooting for free apps, not the best ones? – ‘Qx Calculate’ offers not only the basic nephrology related equations that are available in Medcalc, but also risk scores (Kidney Failure Risk equation, risk of contrast induced AKI post-PCI, 6-month mortality on HD), as well as sections on PD and kidney transplantation. – The applications ‘ABG Acid-base Eval’ and ‘Management of Hyponatremia’, unlike Medcalc, assist not only with calculations- they also walk you through the evaluation process algorithmically, and provide explanations. While practicing nephrologists may not require to use these algorithmic apps owing to their expertise, trainees may find these as better educational tools. Medcalc may be a very popular calculator, but when it comes to offering ‘more’ (from a nephrologist’s perspective), my vote still goes to these others!